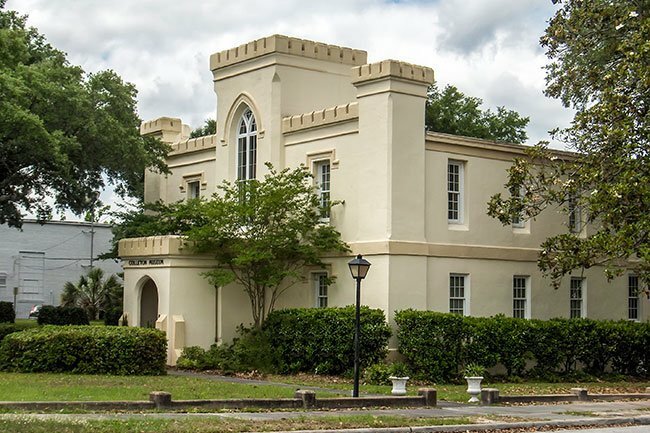 This imposing fortress in Walterboro was built as the Colleton County jail in 1855. 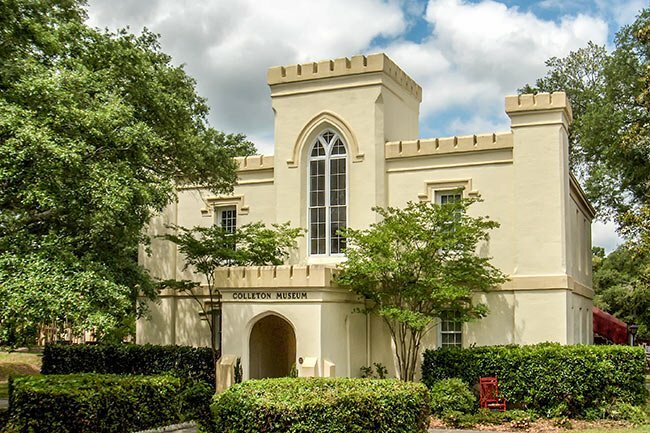 The Neo-Gothic building was designed by noted Charleston architects Edward C. Jones and Francis D. Lee and replaced the first county jail, which was built shortly after Walterboro succeeded Jacksonboro as the county seat in 1817. The foreboding structure was used as a jail until 1937. Since then, it has served as several county administrative offices, including the Chamber of Commerce and probate court. The Colleton Museum was housed on the second floor until recently. The Old Colleton County Jail is a stuccoed brick building built in 1855-56 by J. and B. Lucas of Charleston in the Gothic Revival style. The building is significant architecturally as a fine example of Gothic design in a cultural area where Gothic architecture is a rarity. Its architects, Edward C. Jones and Francis D. Lee, were well known in Charleston and throughout the state. They were in high demand at this time, with designs including courthouses, churches, college buildings, businesses and private residences all over South Carolina. The jail in part resembles a miniature, fortified castle. The front facade has crenellated parapets, turret-like structures at either corner, and a massive central tower above the main entrance. The main entrance is shielded by an extended, enclosed porch with buttresses and a central pointed archway entrance at the front and narrow slit windows on the sides. A large lancet window with hood mold is set in the massive central tower above the main entrance. Hood molds also accent the remaining windows on the front façade.